Is an Italian breed of cattle, formerly principally a draught breed, now raised mainly for beef. It is the largest and one of the oldest cattle breeds in the world. 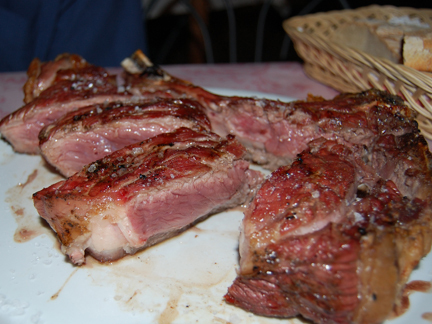 The famous bistecca alla fiorentina is produced from its meat. Simply, this is porterhouse cut (a.k.a. "T-Bone") beef cooked in the style of Florence. Now, technically, it wouldn’t be Steak Florentine if the beef is not from Chianina cows, the huge white cattle raised in the Val di Chiana, near Arezzo, Italy. The steak should be seasoned with salt and pepper and rest comfortably at room temperature before cooking. There are disagreements about whether or not to marinate in olive oil, or simply drizzle with olive before cooking, or to use after cooking. Some also use butter.